The spectacular lights of the aurora borealis are rarely seen outside the Arctic Circle, but fierce solar activity might soon send them southward. The continental US, Japan, and even Mediterranean Europe may all get a taste of the northern lights. 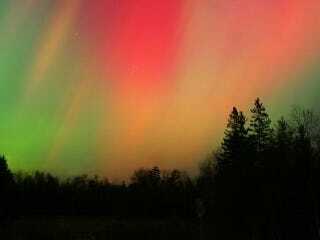 The amazing lights of the aurora borealis and its southern counterpart, the aurora australis, are created by the collision of charged particles in the Earth's magnetic field. As photons from the solar wind are accelerated along the lines of our planet's magnetic field, they undergo incredibly energetic reactions with nitrogen and oxygen atoms in the atmosphere, releasing and absorbing lots of energy in the constant collisions. Collisions with oxygen molecules create the green or brownish-red colors of the aurora, while collisions with nitrogen account for the blue and red colors. Because the lines of Earth's magnetic field run towards the two magnetic poles, the aurora effect is strongest and most likely to be visible to the naked eye in the polar regions. The poles also have an added advantage, as their much longer periods of darkness mean there are far more opportunities for auroras to become visible. But every so often the auroras become visible far away from the poles, thanks to a little help from the Sun. During periods of extreme solar activity, the Sun can create what's known as coronal mass ejections (or CMEs), which are huge blasts of charged particles. In almost all cases, these CMEs miss the Earth completely, and even when they do hit the Earth it's rare that they have any noticeable effects. We've already enjoyed some spectacular auroras thanks to the solar activity, and it only figures to get better. We're in a particularly strong period of solar activity at the moment, and astronomers predict it will peak around 2013. So, if you live anywhere north of the tropics, be sure to set a little time aside three years from now to look up at the night sky. The smart money says that you'll be very glad that you did.